The map below shows the solar energy falling on a horizontal surface of area 1 m2 during one year. It can be seen that areas of Balochistan and Southern Sindh are most gifted while Peshawar, Lahore and Islamabad also have quite favorable conditions. 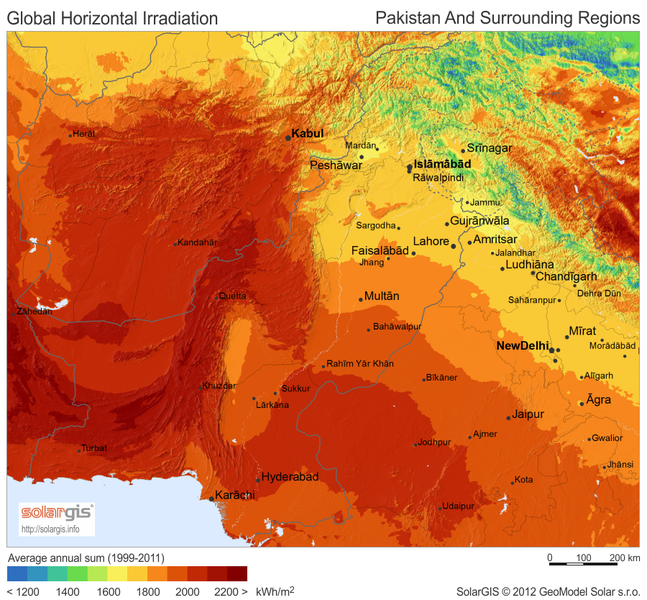 Lets assume that we are installing a Solar System in Karachi where the annual irradiation is around 2000 kWhr/m2. This means that there is an average daily irradiation of around 5.5 kWhr/m2. This means that a Solar Panel of area 1 m2 would receive 5.5 kWhr per day or 1 kW for 5.5 hours daily. If the above Solar Panel has an efficiency of 20% we can produce 200 Watts of electrical energy from it for 5.5 hours each day. 1. The above map is for energy collected by a horizontal surface. A suitably tilted surface or a tracking one can obtain significantly more energy. 2. The received energy not only depends upon the relative position of the Sun and Earth but also on the atmospheric conditions such as cloud cover during different seasons. Posted in Solar Basics. Tagged Solar Irradiance, Solar Pakistan, Solar Resource.